Emma Blanco studied under Yossi Zivoni at the Royal College of Music. She has attended masterclasses with Igor Oistrakh and Yossi Zivoni in Belgium and with Victor Liva, Sophie Till and Ming Yang in the United States. After graduating from the RCM in 2003 she continued her studies privately with Rodney Friend. In 2003 Emma was appointed leader of the National Musicians’ Symphony Orchestra and has also led the London Soloists’ Chamber Orchestra in concerts at the Purcell Room, St-Martins-in-the-Fields and St John’s, Smith Square. Emma was a full-time violinist with Graffiti Classics from 2010-2014, a comedy string quartet touring the world with a unique show that is a refreshing alternative to the stuffy and elitist perception of classical music, making it fun and accessible for everyone, whatever their age or musical inclination! Singing, dancing and playing a mixture of Classical, traditional, folk and jazz numbers, with their 16 strings, their 4 voices and their 8 dancing feet they will blow you away! UK highlights for Emma included the E4 Udderbelly Festival on the Southbank, and being the warm-up act for the Royal Philharmonic Orchestra at Rochester Castle. Graffiti Classics' exotic travels took Emma to New Orleans, the deep South of the USA, Oman, Egypt, Madeira, the Caribbean, Japan, China and Hong Kong. All this aside from the regular trips to Sweden, Ireland, Norway and Spain. Emma now has a busy freelance schedule, based in London. She plays regularly with many orchestras including the Royal Philharmonic Orchestra, London Concert Orchestra and the New London Soloists (now the Trafalgar Sinfonia). 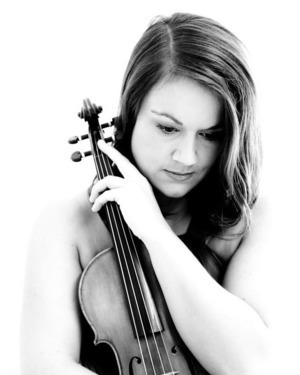 In 2010 Emma recorded on Trafalgar Sinfonia’s new CD with the Allegri Quartet. Emma has recorded for artists including Olly Murs, Katie Melua, Will Young, McFly, Aled Jones, Duke Special and The Indelicates. She has also played on film and TV sessions with groups including Millennia Strings and the London Session Orchestra. Emma's TV appearances include The Brits 2014 and the Graham Norton Show. She has given live performances with international artists such as Imogen Heap, Peter Gabriel, Sister Sledge, Philip Bailey and Ray LaMontagne. In 2009 Emma performed the Bruch Violin Concerto with Dartford Symphony Orchestra.